The two day, world famous Investec Epsom Derby festival dates back to 1780 and is surely one of the greatest race days and social occasions of the British summer calendar. Truly an unmissable event, the festival is held on the first weekend of June at Epsom Downs Racecourse. 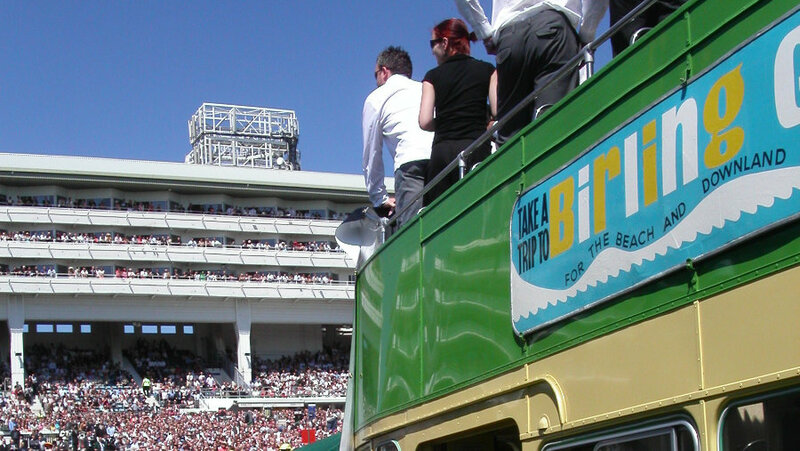 For 2019, why not make your day really special by hiring an iconic vintage bus to take you to the races. Ladies Day, which starts the festival on Friday 31st May, is certainly the place to dress up and be seen. A pleasantly relaxed meet and a refreshing alternative to the crowds Saturday’s event draws. An absolutely magnificent, value for money day out! The Derby on Saturday has to be the show-piece of the flat racing season. Horses and riders pushed to their limit and a superb atmosphere. Fantastic! On both days, we arrange for the buses to be parked close to the rails within an exclusive enclosure, effectively providing you with your own private grandstand. Your Epsom experience starts with the bus collecting you and your guests - usually from Epsom railway station or another local address within about an 8 - 10 mile radius of the course. Alternatively, you may wish to make your own travel arrangements, in which case the bus can be pre-parked inside the enclosure ready to act as an exclusive rendezvous and grandstand upon your arrival. By all means bring picnic hampers with you, or perhaps you may wish to arrange with us for first class experienced caterers to greet you on the course. Epsom racecourse recommend buses be in position for 10am, so we'll arrange timings to suit. 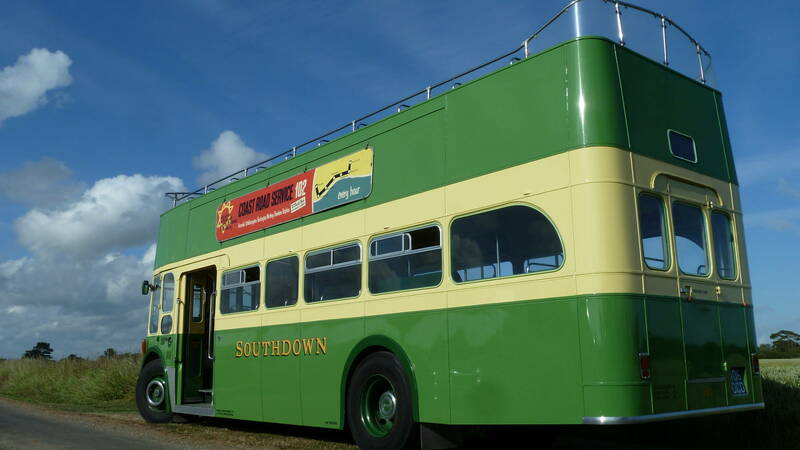 Our vintage open-top offer is bus number 406, a 'Leyland Titan' built in 1964 as one of 25 similar vehicles operating along the Sussex coast. 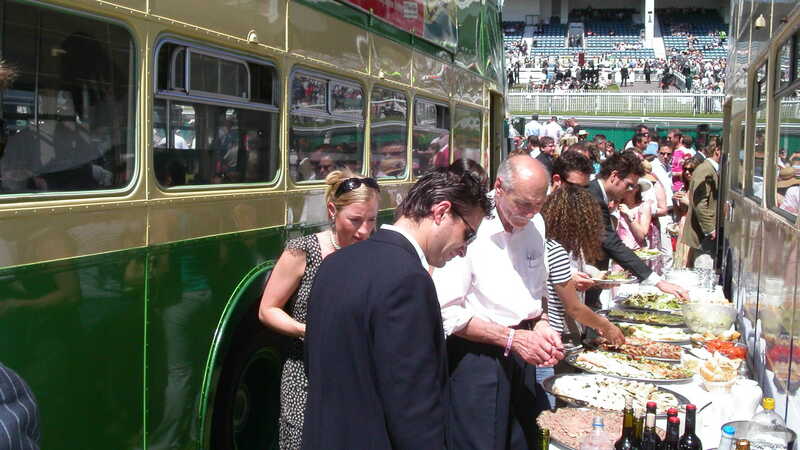 406 is the ideal vehicle for an exciting and unique outing and has been a firm favourite at Epsom racecourse for many years. The bus can carry 69 passengers in total, with 39 seats on the top deck and 30 on the lower. May we suggest you consider limiting the size of your party to 30 people (lower deck capacity) to allow for any unexpected showers. Experience exactly the same open-top thrill with a more modern bus, often with better availability! As you might imagine, all of the open-top vehicles are very popular, so please don't hesitate to get in touch at the earliest opportunity. 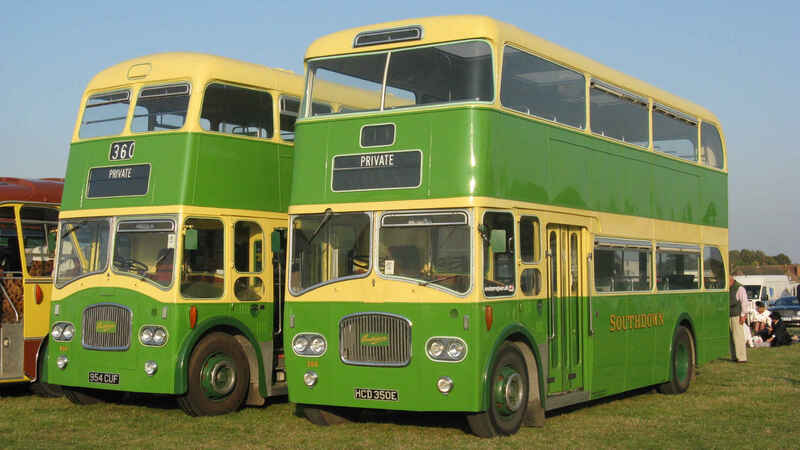 These vintage buses are real gems, being two of the few surviving closed-top examples of this type still available for hire and are regular visitors to the Epsom Derby festival. The slightly older of the two is bus number 954, built in 1964 to a style evocative of late 1950s design. On the other hand, bus number 350 built only 3 years later in 1967, fully embraces the swinging sixties by sporting state of the art large 'Panoramic' side windows and a special curved-glass front to the top deck. Whilst some external details differ, the basic internal layout and design is the same. With 69 seats, (39 upper deck & 30 lower deck), these fine vehicles are ideal for larger or smaller groups alike. Availability of these beautiful buses is limited, so may we strongly recommend you to enquire early. 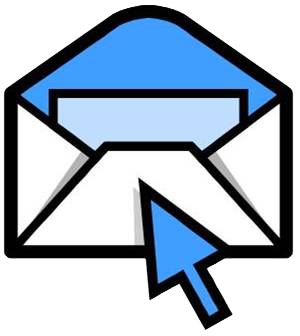 If your enquiry is not about The Epsom Derby festival, please use our standard form.